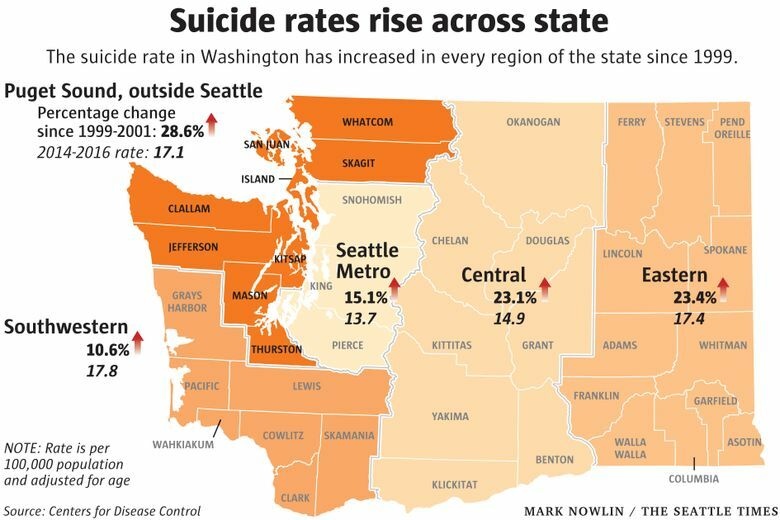 The suicide rate in Washington state has increased 19 percent compared to the period from 1999 to 2001. There are more than 1,100 suicides each year in the state. Suicide is, for most of us, an uncomfortable subject, one we’d rather not talk about. But last week, two prominent people took their own lives — designer Kate Spade and chef/author Anthony Bourdain — and that’s sparked a national conversation on the topic. Adding to the discussion, the Centers for Disease Control (CDC) released a report showing that the rates of suicide are on the rise in nearly every state. Washington is among them. From 2014 to 2016, Washington’s suicide rate was 15.1 deaths per 100,000 people. That represents a 19 percent increase from the rate in the period from 1999 to 2001. There are now more than 1,110 suicide deaths a year in the state, making it the eighth leading cause of death here. And for Washingtonians between the ages of 15 and 34, it ranks as the No. 2 cause, after accidental injuries. I looked at the CDC data for different regions of the state, and all show an increased rate of suicide. In Puget Sound counties outside the Seattle metro area, the rate has gone up the most, by about 29 percent since the period from 1999 to 2001. The smallest increase is in the southwestern part of the state, at 11 percent. In the Seattle metro (King, Pierce and Snohomish counties), the rate increased by 15 percent. “Many people, when they hear about a suicide — especially a celebrity suicide — they think it’s something that happens out of the blue, that it’s sudden,” he said. But in fact, research shows that the process leading up to a person inflicting self-harm is very gradual, and there are many potential points of intervention along the way. In 2012, Washington became the first state in the nation to require all health-care providers — from physicians to physical therapists to pharmacists — to complete training in approaches to suicide risk assessment, management and treatment. This is an important step in prevention because, while many people who die by suicide do not receive mental health counseling, they commonly interact with other types of health-care providers in the months before the suicide.